Last summer, my best-friend-since-third-grade and MOH Morgan was over visiting at my parents’ house. We’d spent the day at grandma’s, going over table layout ideas for the wedding. I wanted to show her a cute vintage beaded clutch my grandma had given me when I was a teenager. I pulled it out of my old desk drawer. 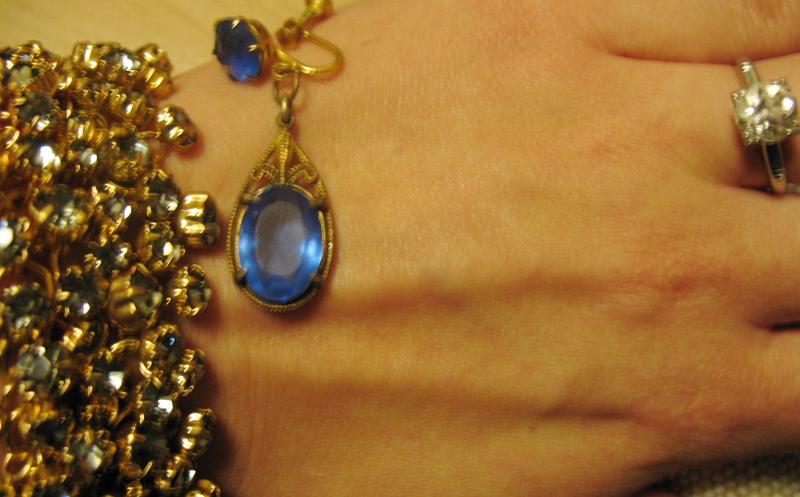 I nearly didn’t undo the clasp to show the inside, but just as I was putting it away, I did, and was surprised when a pair of deep blue antique earrings slid out. 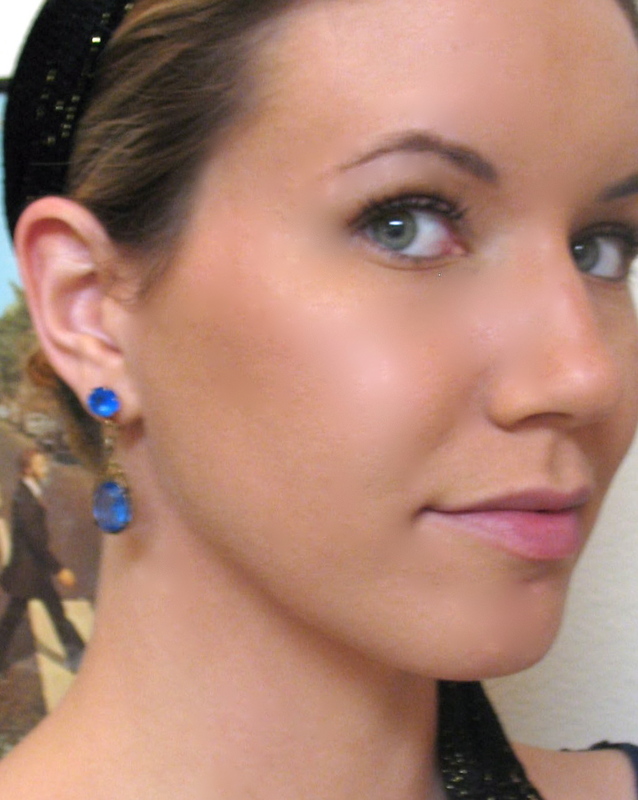 These were my beloved earrings, also from grandma, that she had gifted me years ago, but I’d thought they were lost! I hadn’t seen them for at least six years, and in fact had searched high and low for them all around the house. Who knew they were tucked away safely in the old beaded clutch that entire time? Oh, yay, they make me so happy! Have any of you ladies found something precious to you that you thought was lost forever? It’s a wonderful feeling, isn’t it? By the way, since maybe a couple of you are wondering why Miss Paisley would be a pansy about ear piercings, let me tell you a little story. You might want to find your fiance first, and hold his hand while you read this, or just skip the next paragraph altogether, cuz it ain’t gonna be pretty. I dread getting my ears pierced not because of the pain of getting a piercing–I actually had my ears double pierced as well as my belly button and eyebrow. No, I dread getting my ears pierced because as a teenager, I got a very bad infection. I’d just gotten a new set in my ears, for a total of four holes. You’re not supposed to be taking ’em in and out right after they’re pierced, but I was in a school play, The Rivals, by Richard Brinsley Sheridan, in which I portrayed a male character. And the director was reeeeally into being authentic, so she made me take my earrings out for every performance. After the curtains closed the last time, I put my earrings back in. The next morning, I awoke, and discovered an ear lobe that was bright red, like a cherry tomato, and swollen into an unholy pain like none I’d ever felt. My ear had literally SWALLOWED one of the earrings in the middle of the night! Fortunately, a doctor dug around my ear lobe for several minutes with sharp, tong-like apparatus to get it out. Ahah, yuck! Shrug, shiver, shake it out-Jillian-Michaels-style, because that story’s over with. Now that you’ve sufficiently winced until you feared permanent wrinkle damage… let’s get back to discussing pretty jewels, shall we? Yes PLEASE. 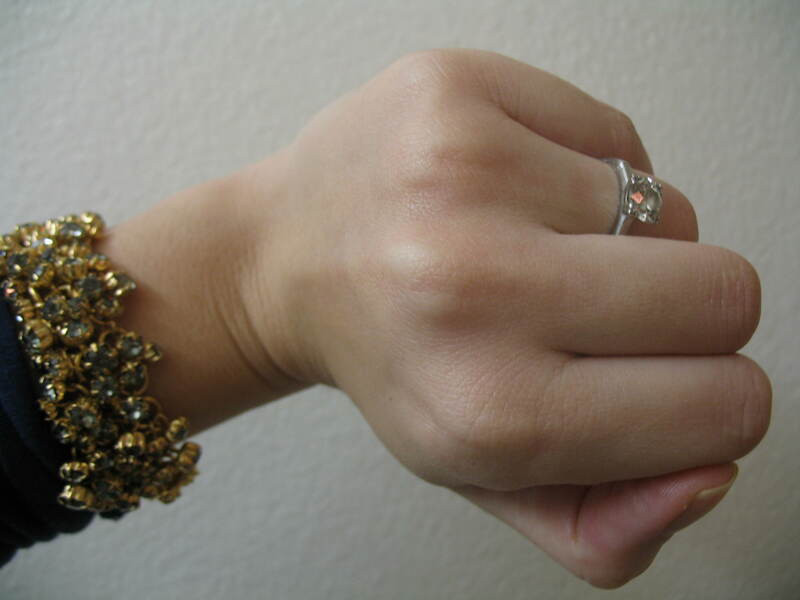 I’m also going to wear a bracelet on my wedding day. It’s loaded with pale blue crystals. 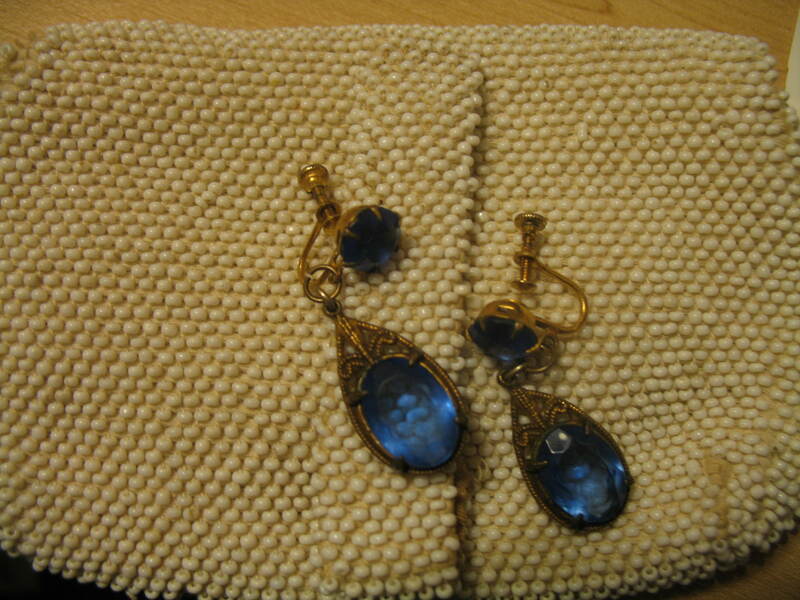 They don’t match the deep blue of the earrings at all, but the gold matches. I got it on sale from J. Crew. Um, at least my man-hands make my wrists look tiny? OK, enough sarcastic jokes about my hands. What should I wear as a necklace? I suppose I’ll have to show you girls my dress in order to decide that? I’m wondering how the matching J. 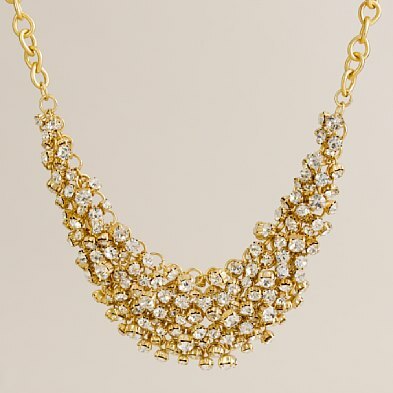 Crew necklace would look on me, with my matching bracelet but totally-different-earrings? Hmmm. Hemmm. Hmmm. I just don’t know. Can’t picture it, really. At least with the non-matching bracelet, it’s way down there away from my earrings, cloaked in the shadow of my man-hand. Plus, I’m clear outta money for such things as necklaces, so I may go bare-necked on the big day. Or raid my grandma’s jewelry box to see what other antiques I can find. 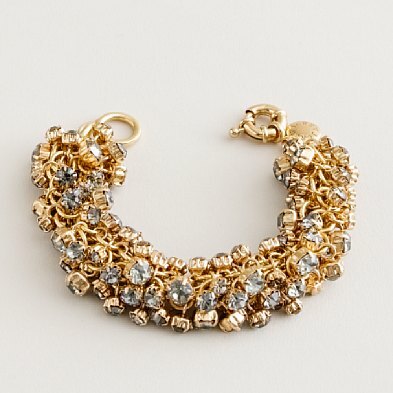 Is anybody else having trouble putting together a jewelry ensemble? Oh, and don’t forget to tell me stories of your long-lost treasures that have magically resurfaced. Those are the best. Even better than finding an unexpected $20 bill in a pea coat pocket.